The newcomers intended to create societies similar to those in Europe, but their New World settlements all became hybrids, combining the familiar with the new. The presence of indigenous peoples, a concentration on producing goods for export, and limited Old World immigration shaped the settlements in ways that no one had foreseen. 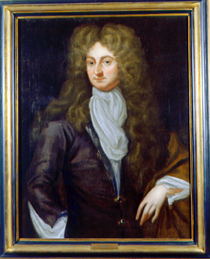 To promote a ruling class, Governor Berkeley sought sons of royalist families that supported the Crown during the English civil war. Among them was William Randolph of Warwickshire, a second son who stood to inherit nothing in England. He arrived in Virginia about 1670 became a prominent office-holder. 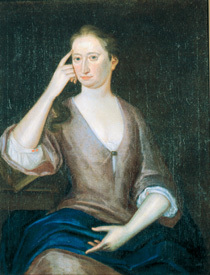 This portrait by an unknown British artist is c. 1695. In 1676, William Randolph married Mary Isham of nearby Bermuda Hundred. The couple were parents to nine children. Toward the close of the century, the Virginia colony reached greater gender balance, and European settlers there started to live longer. By 1700, Virginia’s English population was probably reproducing itself by natural increase. Leading men promoted an English ideal for Virginia society. They hoped to establish a ruling class of wealthy families, with landed estates worked by bound laborers. Yet indigenous Americans had no desire to work as peasants for Englishmen, and poor Englishmen would only immigrate as servants when promised a chance to obtain some land of their own. As available land dwindled, conflict exploded in Bacon's Rebellion of 1676, when landless rebels attacked both the government at Jamestown and Native groups. Conflict between rich and poor Englishmen lessened as Virginians turned to exploiting the labor of Africans. Leading men promoted a French ideal for Québec society. They imagined a hierarchical and religiously orthodox settlement, with merchant companies to control the fur trade, a ruling class owning large landed estates, and peasants and craftsmen to work on them. Limited immigration from France and gender imbalance prevented the full success of these ideas. One visionary plan to solve the problem was to incorporate Huron, Algonkin, and Montagnais converts to Christianity into French culture and society. Champlain told the Huron, "Our young men will marry your daughters, and we shall become one people." 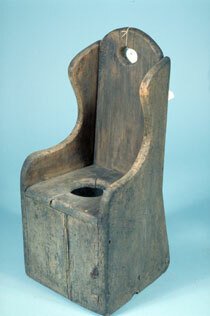 This child’s commode chair reminds us that there were complete families in early New France. The fur monopolies that ran the colony worried that immigration would introduce competitors and expanding settlements would drive away fur-bearing animals. After 1663, royal authorities introduced policies to increase the population. They recruited hundreds of French “filles du Roy” (king’s girls) to become wives in New France. While the English excluded the Powhatans from their society, and the French considered incorporating the Huron into theirs, Spanish settlers in New Mexico lived amidst a Pueblo population that far outnumbered them and was essential to their society. Spanish settlers, Native servants from Mexico, and Pueblo peoples negotiated complex relationships and exchanged aspects of their cultures. Among themselves, Pueblo peoples found a common situation in their subjection to the newcomers and a common language in Spanish. 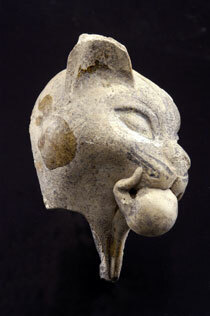 Cats played a role in European households and European mythology, but they were new to Pueblo peoples. Indigenous potters added ceramic cats and mice to their repertoire of animal forms in order to appeal to the Spanish consumer, as in this example made at Pecos in the seventeenth or eighteenth century.